Objective: Laparoscopic repair of large, complicated hiatal hernias is associated with a high risk of recurrence. Biologic mesh decreases recurrence and prevents complications associated with synthetic mesh; but its safety profile has not yet been fully determined. To answer this question we analyzed the outcomes of biologic mesh used to repair these “high risk” hiatal hernias. Methods: All patients (n=125) who had biologic mesh (Surgisis®, Cook Medical Inc.) implanted and who had a minimum follow-up of 6 months were included in this study. We recorded all complications and sent all patients a standardized symptom questionnaire. Results: Median follow-up was 37 months (6- 103 months). Repairs were performed for para-esophageal hernia in 86 (69%), large sliding hiatal hernia with obesity in 6 (5%) and redo Nissen fundoplication in 33 patients (26%). There were no perioperative complications related to the mesh. Thirty day mortality was nil. Completed questionnaires were collected from 49 patients (40%), of these three patients (6%) developed a symptomatic recurrent hiatal hernia, one required reoperation. No patient has had an erosion, stricture, or complication directly related to the mesh. 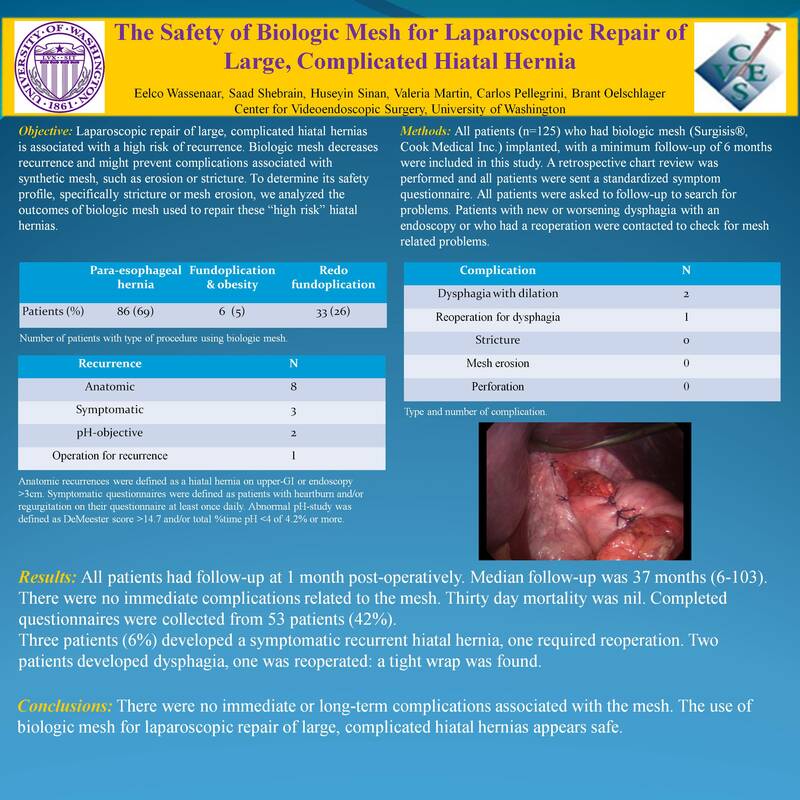 Conclusions: We experienced no immediate or long-term complications associated with the mesh, thus conclude that the use of biologic mesh for laparoscopic repair of large, complicated hiatal hernias appears safe.